Logitech's K380 multi-device keyboard was a boon for mobile device owners who wanted to quickly switch between typing into their main computer and a smartphone or tablet. The peripherals giant has followed it up with the K780, which looks like a more convincing option for desktop (or even laptop) users thanks to its right hand-positioned 10-key numberpad. Obviously that makes it the longer, and therefore less bag-friendly option of the two. However, the K780 appears to bear all of the qualities of its predecessor. 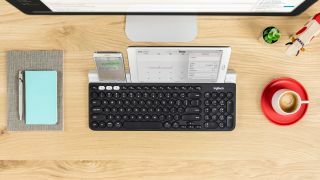 They include concave keys that make you feeling like you're tapping away on a silent typewriter, and an Easy-Switch button that lets you chop and change between up to three Bluetooth (or Wireless using a USB receiver) connected devices. Handily, the K780 now sits in a base that features a rubberised slot for holding smartphones and tablets at a suitable angle for reading – and it's even big enough to accommodate Apple's iPad Pro. It means you won't have to crane your neck to look at your mobile device's display while typing out a message on WhatsApp when the device is resting on the table. Logitech is claiming that you'll squeeze up to 24 months of battery life out of the K780, which will be available to buy in July for £74.99 (around US$101 or AUS$136).